President Donald Trump's top national security adviser said he finds it "hard to believe" Vladimir Putin didn't know about top Russian military intelligence officials' extensive efforts to interfere in the 2016 U.S. presidential election -- efforts the Russian president has repeatedly denied were state sponsored. In an interview for "This Week" on Sunday, ABC News Chief White House Correspondent Jonathan Karl asked White House National Security Adviser John Bolton, "Do you have any doubt that Putin himself knew what was going on, at the very least?" Bolton said that when he met with Putin in Moscow at the end of June to prepare for the Trump-Putin summit, the Russian president "made it plain that he said the Russian state was not involved," adding, "he was very clear with his translator that that's the word that he wanted." "Now," Bolton added, "we'll have to see given that these are allegations concerning GRU agents obviously part of the Russian state, what he says about it now." Trump is set to meet with Putin in Helsinki on Monday. The summit was first announced June 27 after Bolton met with Putin and other senior Russian officials in Moscow. 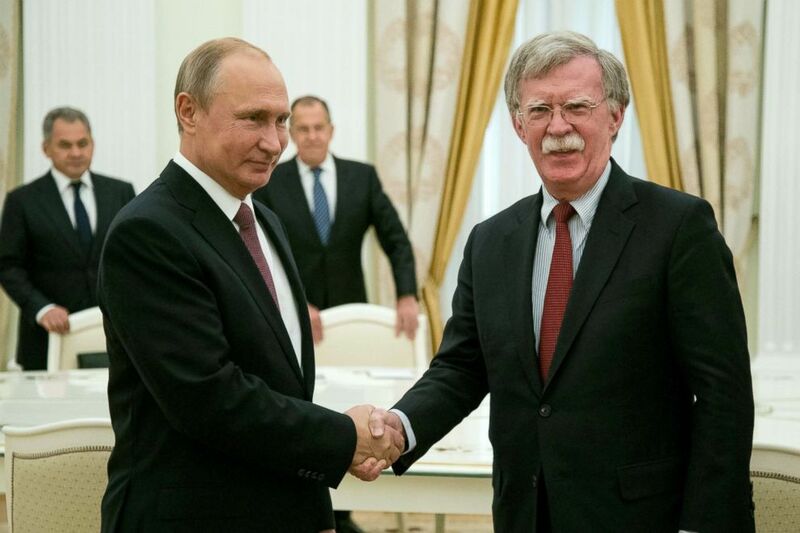 Russian President Vladimir Putin, left, shakes hands with US National security adviser John Bolton during their meeting in Moscow, June 27, 2018. The summit is scheduled for just days after special counsel Robert Mueller filed an indictment Friday charging 12 Russian intelligence officers for conspiring to interfere in the 2016 U.S. presidential election. The indictment alleges that the dozen Russians worked in the GRU, Russia's intelligence body. The named defendants are specifically alleged to have taken part in a sustained effort to hack into the networks of the Democratic National Committee, the Democratic Congressional Campaign Committee and the campaign of Democratic candidate Hillary Clinton. Deputy Attorney General Rod Rosenstein, who has overseen the investigation since Attorney General Jeff Sessions recused himself, announced the charges in a press conference on Friday, saying that while there were Americans who corresponded with these officers, none of them appear to have known they were corresponding with members of the Russian government. Rosenstein said he had briefed the president "earlier this week" on the charges. "Is there any way," Karl pressed Bolton on "This Week," "that we could have 12 officials, some of them quite senior in Russian military intelligence, carry out an operation to undermine a U.S. presidential election and Putin himself would not know? Do you find that in any way credible?" "I find it hard to believe," Bolton responded. "But that's what one of the purposes of this meeting is, so the president can see eye to eye with President Putin and ask him about it." Karl asked Bolton if Trump felt "blindsided or undermined by the timing of that indictment," and Bolton replied that it actually "strengthened" Trump's hand. "The president was briefed on the indictment coming," Bolton said. "I spoke with him about it. He was perfectly prepared to have it come before the meeting with Putin. I would say, in fact, it strengthens his hand ... I think the president can put this on the table and say, 'This is a serious matter that we need to talk about.'" "If Putin is unwilling to acknowledge the Russian state's effort to interfere in our elections," Karl asked, "can you really trust him on anything else?" "I think the president will handle this as he chooses," Bolton said. "I think he'll put it to President Putin. He said he's going to do that. He'll listen to President Putin's response, and we'll go from there." 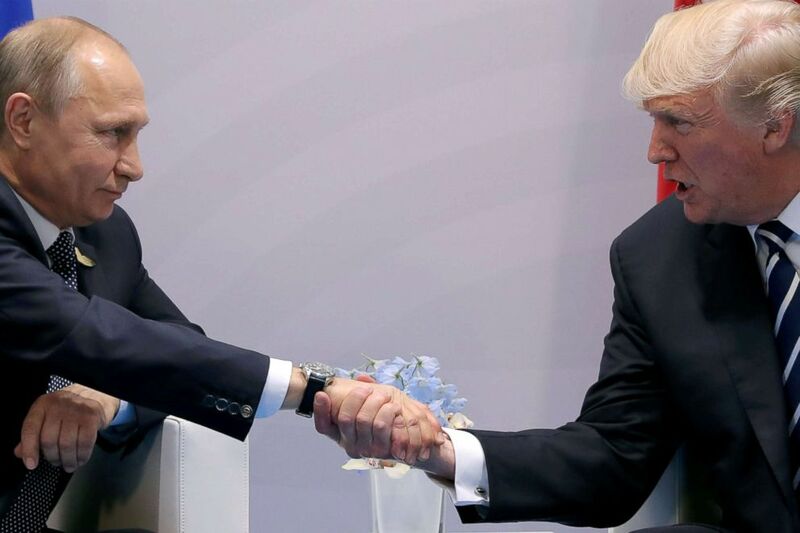 Russian President Vladimir Putin shakes hands with President Donald Trump during the their bilateral meeting at the G20 summit in Hamburg, Germany, July 7, 2017. Karl pressed: "Well, let me ask you as the national security adviser to the president: Do you think that President Trump should trust Vladimir Putin?" "Look," Bolton replied, "I've said this before, I'll say it again: I'm the national security adviser, not the national security decision maker. It's a privilege to give my advice to the president. I don't discuss it publicly. He's going to make the decision how to handle this." Karl asked Bolton if Trump would ask Putin "to extradite those 12 individuals who have been indicted." Bolton said that the United States doesn't have an extradition treaty with Russia. "Extradition treaty or not," Karl said, "the president could ask, even demand of Putin that he turned these individuals over? Will he do that?" "It's pretty silly for the president to demand something that he can't get legally," Bolton said. Trump said he would ask. "Well I might, I hadn't thought of that, but I'll certainly I'll be asking about it," Trump said. 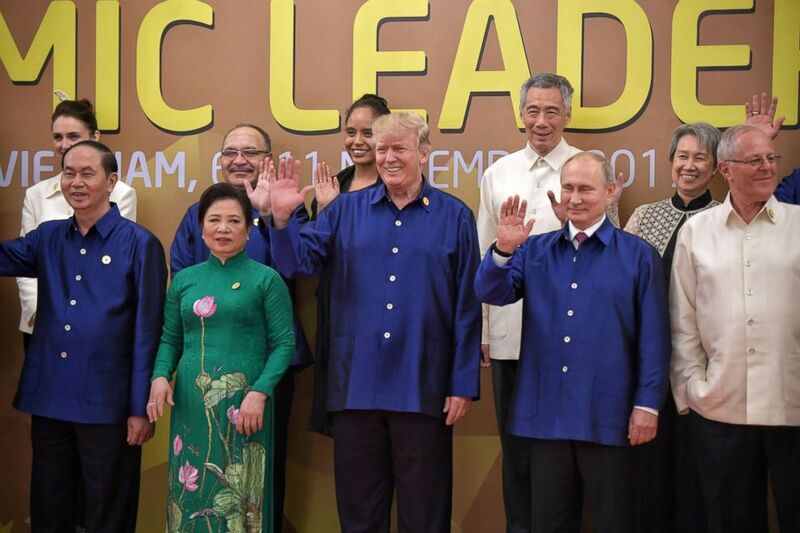 President Donald Trump (C), and Russian President Vladimir Putin (2-R) pose for a group photograph with fellow APEC leadersat the 25th Asia-Pacific Economic Cooperation summit (APEC) at the Sheraton Hotel in Da Nang, Vietnam, Nov. 10, 2017. Karl asked Bolton how concerned he was that Russia would again try to undermine a U.S. election. "Well, I think we're quite concerned about it," Bolton said. "There's a lot of -- a lot of things going on -- that we can't talk about because they're classified, and obviously you're not going to alert your adversaries or those trying to corrupt the election process to what we're doing. "But I think it's very clear that the president's determined we're not going to have any outsider interfere with the integrity of our electoral process." Asked if Trump would present Putin "with the evidence that it was ... Russian government interference with our election," Bolton said the Russians were "well aware" of the Mueller indictments. "We're not looking for concrete deliverables here," Bolton said. "It's very important that the president have a direct, one-on-one conversation with President Putin. That's how this is going to start off."